TeenNick has been spotlighting John Kricfalusi’s The Ren & Stimpy Show during its nostalgia-themed programming block, The Splat, all this week. To promote this television event, someone in the Nickelodeon hierarchy apparently had this idea: “Why don’t we have comedian Andy Milonakis dress up as one of Ren & Stimpy‘s most obscure, fleeting supporting characters and answer important life questions from viewers?” Specifically, Milonakis is portraying Stinky Wizzleteats, the deranged, Burl Ives-inspired folk singer who memorably crooned Stimpy’s favorite song in the well-regarded “Stimpy’s Invention” episode from 1993. Other than appearing on the cartoon duo’s obligatory Christmas album that same year, Wizzleteats has mostly laid low for the past 22 years. Until now, that is. By tweeting @thesplat using the hashtag #GOASKSTINKY, viewers can direct their most pressing queries to the notoriously ill-tempered, violent children’s entertainer, who is now promoting himself as some kind of half-assed life coach. 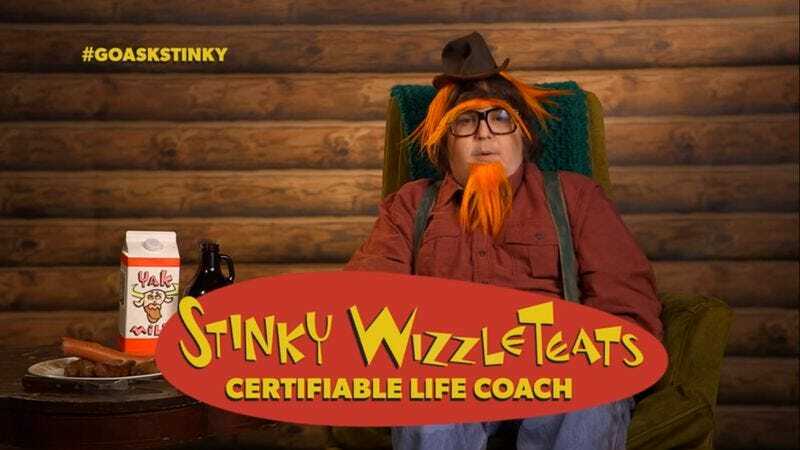 Apart from dressing like the character, complete with a carrot-orange goatee with matching hair and eyebrows, the baby-faced Milonakis has made virtually no attempt to imitate the cantakerous, raspy-voiced Stinky Wizzleteats of old. But the utter lack of common sense and responsibility are still intact, and Wizzleteats freely admits that his responses are “not the best solutions, but my solutions to your everyday problems.” He tells one viewer, for instance, that his self-worth “is $32.95. And that’s not too bad.” The meaning of life, Wizzleteats finds, is mostly food-based. “Maybe it’s because I’m a Fatty McFat Fat,” he admits. “But I can’t see anything else feasible in a land where you have to keep working just to survive and survive to work.” All these years later, Stinky is still delivering the unadorned truth to his fans.